It has been suggested that Ministry of Transport be merged into this article. (Discuss) Proposed since July 2018. 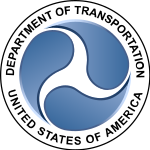 The seal of the United State's Department of Transportation, the largest of all DOT's. Some states have based their DOT logo after this one, such as that of Iowa and North Carolina. Other state (DOT) listed individually. ^ "About Us". US Department of Transportation. 2012-03-01. Retrieved 2019-02-06.